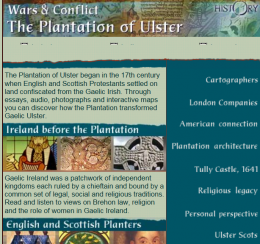 If you want to make a start looking into the history of the Plantation of Ulster, then the BBC has a very good resource available within its online archive. Developed by BBC History under the overarching theme of Wars and Conflict, it’s an excellent introduction to the topic both for the general reader and those who’d like to dig a bit deeper. 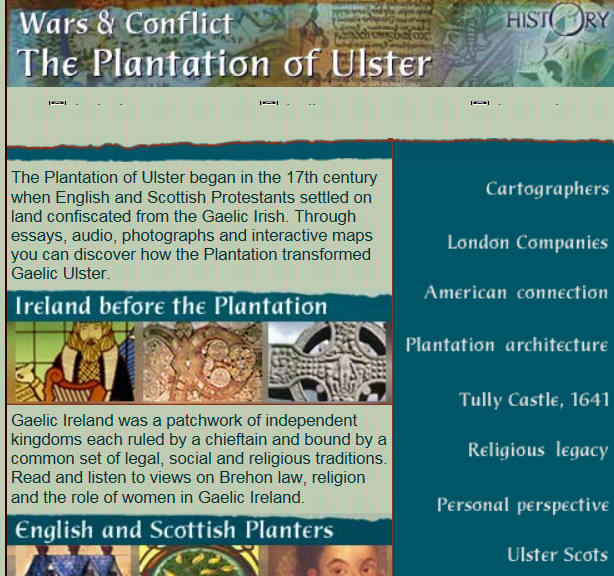 Through essays, audio, photographs and interactive maps, you can discover how the Plantation transformed Ulster. There are two main sections. That on Ireland before the Plantation looks at the legal and religious systems that regulated political and social life in Gaelic Ireland and the indispensable role played by the bardic poets who charted its rise and fall. The section on English and Scottish planters touches on early Scottish migration to Ireland from the 14th century, before looking more closely at the history of Plantation from Elizabeth I’s first colony in 1571 until the 1641 Catholic Rebellion, and then examining the long term consequences of Plantation. Topics covered include the City of London livery companies, the economic background of the settlers and the social and economic conditions in Ulster, and women and the Plantation. The resource also has supplementary pages on a variety of subjects including cartography, the connection to English settlement in America, Plantation architecture and the linguistic history of Ulster. The audio clips are extensive and there are maps, animations and other aids to help you dig deeper into the history of the Plantation. 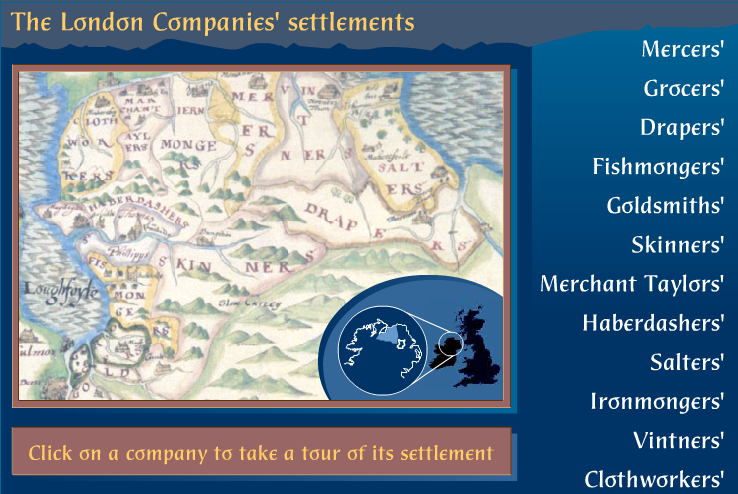 Of particular note are the animations of Thomas Raven’s maps of 1622. These maps form part of the evidence submitted to King Charles I in support of the charge against the City of London and the livery companies that they were not fulfilling their legal obligations to implement the Plantation. This charge led to the compilation of the Great Parchment Book which documents their Irish estates. There are two major caveats about the pages. Archived web pages are not updated so new research, discoveries and interpretations will not feature and they become increasingly out of date. Most significantly from the point of view of this blog, an essential original documentary source for the Londonderry Plantation is not referenced. Of course, that source is the Great Parchment Book which was unavailable to researchers at the time the pages were put together (around 2000) owing to its damaged condition. Nevertheless, these BBC History archived pages on the Plantation are well worth exploring alongside the virtually reconstructed Great Parchment Book. 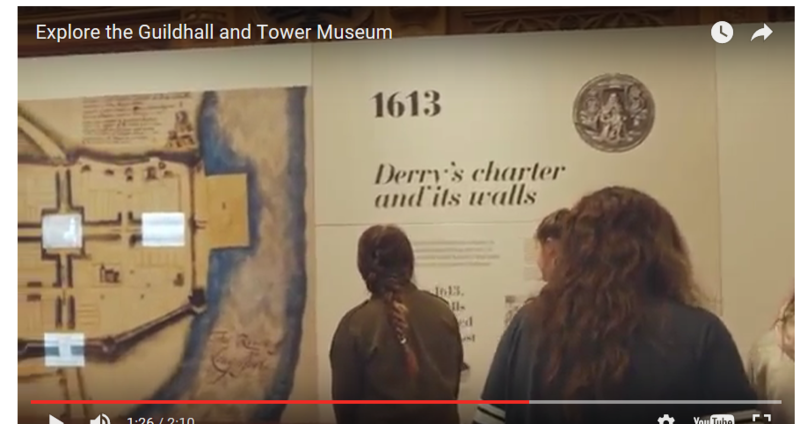 Visitors to Northern Ireland can also find out more from the continuing exhibition at Derry Guildhall, People, Plantation, Perspectives which opened in May 2013 in connection with the 400th anniversary of the building of the City walls, the driver for the Great Parchment Book project to make available the manuscript which lies at the heart of the story.